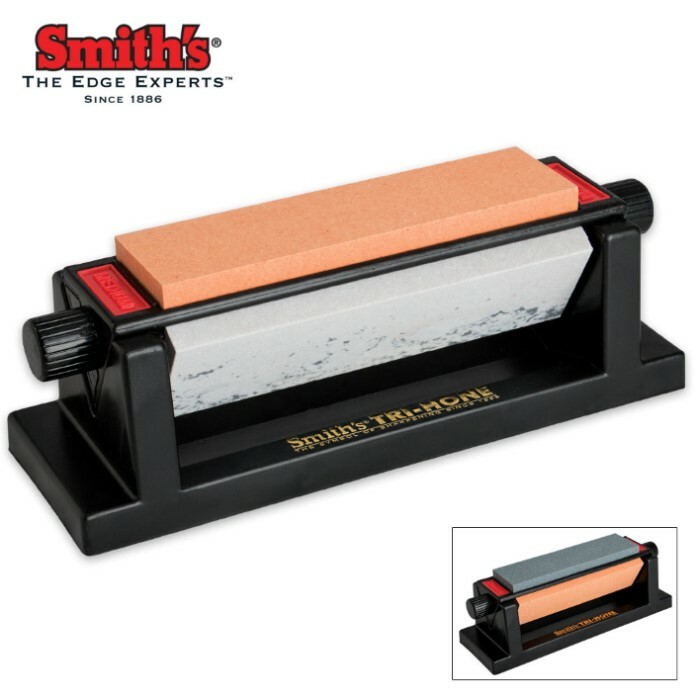 Smith's Three Stone Sharpening System features a 6" Medium Arkansas Stone, 6" Fine Arkansas Stone, and 6" Coarse Synthetic Stone mounted on a molded plastic triangle with handles on the end for easy stone rotation and easy to read stone identification. The sturdy molded plastic base has non-skid rubber feet for safety, "V" trough to catch the oil drippings, and is easy to clean. A bottle of Premium Honing Solution and a sharpening angle guide are also included. Although the listing reads that it "features a 6" Medium Arkansas Stone, 6" Fine Arkansas Stone, and 6" Coarse Synthetic Stone", the medium is also synthetic, looking something like an orange aluminum oxide than the gray medium Arkansas stone pictured. It works, but I worry about it's longevity. Other than that, I'm pleased. The base feels rather light without the stones, but the unit as a hole feels sturdy and doesn't slide around or wobble when being used. Great product. I've only used it on eight knives so far, but it brought even the worst of them to a sharp point with very little trouble. 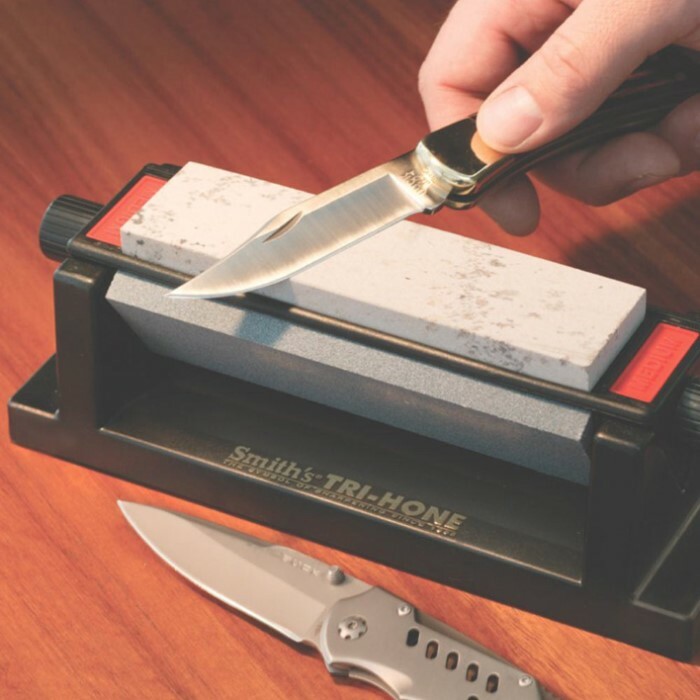 The coarse stone will quickly give an edge to even the most dull knives, and then using the medium and fine stones I was able to give them a razor sharp finish (I got my Ontario Marine Combat Knife that was dull when I bought it to an edge sharper than my Cold Steel Voyager that I got in this same order and it took me only a matter of minutes). 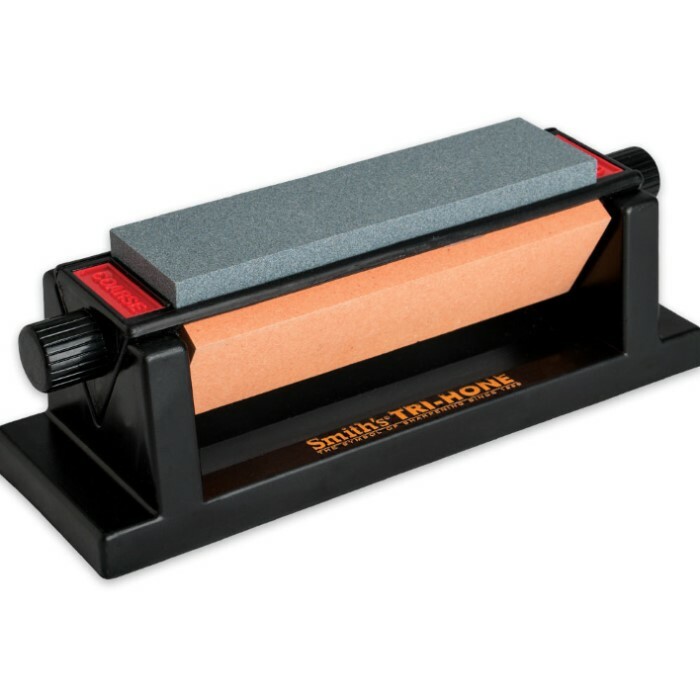 The angle guide and insert are interesting and could be very handy to someone without any sharpening experience (or even with a small amount of experience). Again, excellent product and fast shipping on the part of Trueswords.